The long-running denial of the authenticity of Genesis (and hence the whole Bible) by atheists, skeptics, and liberals took a new turn in 2010. 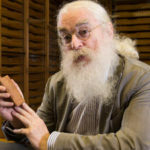 This was when British Museum curator Irving Finkel claimed that he had translated a Babylonian tablet dating from around 1750 BC which contained an account of the Flood wherein the Ark (according to Finkel) was circular in shape, and was a giant coracle. He further claimed that this legend was part of the Babylonian Atrahasis Epic,1 and that it predated the Genesis account by a thousand years and so was the original Flood story on which the Genesis account was based. See our 2010 article “Watering down” the Genesis Flood. 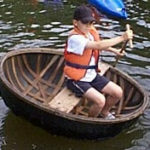 A coracle is a small round portable boat, originally used by Britons, who made them from a horse or bullock hide, which limited their size. They are still used today (apart from for fun) by salmon fishermen on Welsh and Scottish lakes and rivers. The name derives from the Welsh corwgl or curwgl (cf. the Irish curach, a boat). They are also used in India, Tibet, Vietnam, and in Iraq, where they are called quaffa or guffa. These latter are about 2-metres in diameter for personal use such as fishing, and up to a maximum of about 6-metres in diameter for use as river taxis. They are basically a lidless basket, nowadays mostly made of calico, canvas, or plastic, waterproofed by a coating of tar or bitumen, and stretched over a framework of wooden rods. They are propelled by the user(s) with one or more wide-bladed paddles. They are obviously not suitable for use in wet weather or for coping with stormy ocean conditions. In 2014, Finkel produced a book titled The Ark Before Noah,2 in which he gave word-for-word details of his translation of the cuneiform writing on the object that he had dubbed the ‘Ark Tablet’. These details included the precise dimensions of the vessel described, as well as the quantities of timber and bitumen needed to build it. For our comprehensive analysis of this book, by CMI author and engineer, Dominic Statham, see The real Noah’s Ark? Also in 2014, the UK’s TV Channel 4 aired a documentary-style film titled The Real Noah’s Ark: Secret History.3 In 2015, National Geographic Channel aired a similar film titled Rebuilding Noah’s Ark.4 In this, proof of Finkel’s claims are put to the test with viewers being told: “the only feasible thing to do was to take the instructions line by line and build a giant coracle”, i.e. similar to the one in his translation of his tablet. The film describes his attempt to do just that. This article describes the result. According to Finkel’s translation, the vessel described in the tablet was a “giant coiled rope basket”,5 67.7 metres in diameter,6 with wooden ribs, and with the whole of the hull and side constructed solely from a huge coil of rope made from palm fibre,7 covered in bitumen to make it waterproof. Finkel’s own rib measurements of 60 m exactly fit a square vessel of side 60 m, and do not fit a round vessel of diameter 67.7 m.
Engineer Dominic Statham shows that the dimensions given in Finkel’s book The Ark Before Noah contradict his proposition that the Babylonian vessel was round. Statham points out that the phrase “let her length and breadth be equal” applies to a square just as much as to a circle (as claimed by Finkel, p. 126). Then, according to Finkel’s translation, the area of his vessel was exactly 3,600 sq. metres (pp. 161, 333), which equates to sides of 60 m x 60 m if a square, or a diameter of 67.7 m if a circle (p. 334).8 Finkel says the wooden ribs were “ten nindan long” (p. 347), and “one nindan equals 6 metres” (pp. 328, 344). Thus Finkel’s own rib measurements of 60 metres exactly fit a square vessel of side 60 metres, and do not fit a round vessel of diameter 67.7 metres as he argues. For full details, see Statham’s article The real Noah’s Ark?. So, concerning any proofs of Finkel’s claims, this non-substantiation of the primary concept of rotundity would appear to be Strike One! Nevertheless, to plan building this alleged round Ark, according to the film, Finkel formed a small advisory committee with maritime historian Dr Eric Staples and maritime archaeologist Tom Vosmer. The first conclusion these marine experts came to was that such a colossal coracle could not be built! The problem was its size. They calculated that a 67-metre-diameter vessel would require about 1.5 million kg of wood and would weigh about 2,200 tons. Commenting, the Daily Mail reported that such a vessel “would have been half the size of a football pitch in area and built with enough rope to stretch from Edinburgh to London.”9 In his book (pp. 166, 341), Finkel gives the length of rope needed as 527 km. Viewers are told that Finkel’s committee finally decided that “the biggest version sustainable as a vessel” was a 12-metre replica, i.e. just under one-fifth the full size. So concerning any proofs of Finkel’s claims, this expert maritime opinion that a full-size giant coracle could not be built would appear to be Strike Two! 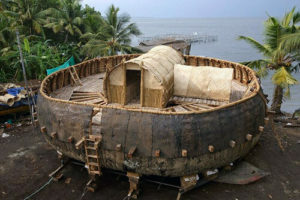 The committee engaged Azzam Alwash, described as “possibly the last living coracle builder”, to supervise a team of 40 workers in Kerala, South India, to build the 12-metre replica—a project lasting about six months. It involved constructing a frame of 60 wooden ribs made from 17 tons of timber, with the hull and side (250 sq. metres in area) fabricated from concentrically coiled rope made from marsh reeds, and covered in 9 tons of bitumen mixed with “animal fat to give it body” and “fish oil to make it sticky”. It was estimated that it would weigh about 35 tons, and viewers are told this meant that when it is in the sea there would be “35 tons of pressure coming up from the bottom”. This required the use of multiple wooden stanchions between the hull and the deck “to stop the bottom from collapsing upwards”. Finally the 12-metre vessel is finished, it is jacked up, and rollers are put underneath to move it into a nearby lake. Viewers are told: “the legend … is about to be put to the test”. Then: “35 tons of Babylonian Ark is ready to launch.” And: “The moment of truth will be its first contact with water.” Irving Finkel is on hand to witness his triumph. No euphemisms please; what this means is that after two hours of steady pumping with industrial-type equipment, the amount of water being discharged was eventually equal to the amount flooding in! This complete unseaworthiness of the replica vessel surely is Strike Three! 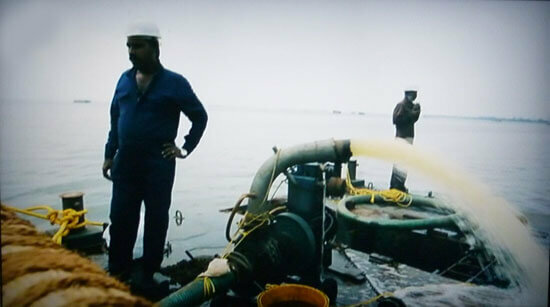 After two hours of pumping, the amount of water being discharged was eventually equal to the amount flooding in. The one-fifth-size replica vessel leaked and would have sunk if not for the use of a high-capacity external pump. Thus, everything about this version of the Ark fails as a prototype of the real Ark. What then of Finkel’s claim, made repeatedly throughout the film, that the story inscribed on this Babylonian tablet precedes the Genesis account? Answer: It doesn’t, according to the true history of the world, recorded in Genesis. The first conclusion these maritime experts came to was that such a colossal coracle could not be built. Genesis is not myth or legend or merely a morality story (as claimed by Finkel), but is Moses’ account of human history, with Moses guided by God’s Holy Spirit (2 Timothy 3:16) in what he wrote. 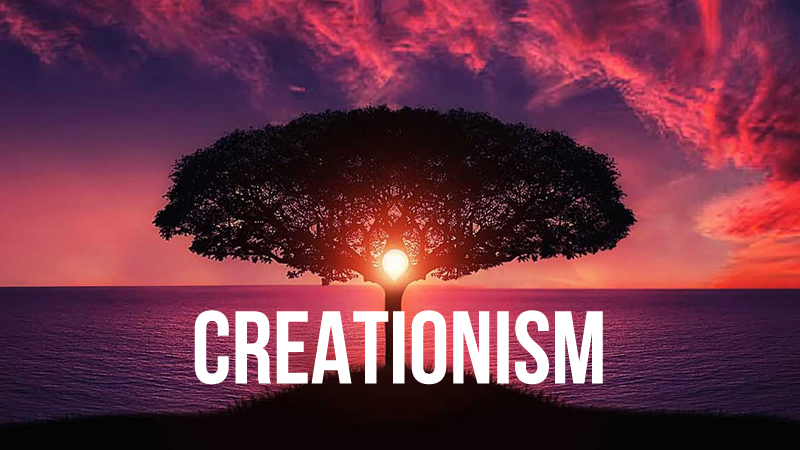 Human history began when Almighty God created Adam “in the image of God” (Genesis 1:26–27; 2:7) on Day 6 of Creation Week, about 6,000 years ago. (See How does the Bible teach 6000 years?) Adam chose to disobey God, and as a result mankind acquired a sin nature. By the time of Noah, “the wickedness of man was great in the earth” and “every intention of the thoughts of his heart was only evil continually” (Genesis 6:5). The effect of this sin was so pervasive and so appalling that God, by means of the Flood, “determined to make an end of all flesh, for the earth is filled with violence through them”, with the exception of Noah, who was “blameless in his generation” (Genesis 6:9; 7:1). God gave Noah specific instructions to build a huge rectangular vessel in which Noah and his wife and his three sons and their wives were the only humans saved from the Flood, which was worldwide. In the film, viewers are told: “The faithful have searched for evidence of a global Flood in every continent; so far none has been found.” Wrong! Abundant and dramatic evidence for the reality of the global Flood includes fossils buried in sedimentary rock all over the world, marine fossils on the tops of mountains, thick and widespread sedimentary deposits across the continents, abundant evidence for geologic catastrophe, and the shape of the landscapes. Of course, a person won’t see this evidence if they don’t know what they are looking for. For visual evidence of vast continental flooding, see Sedimentary Blankets. Obviously some details of the various stories are similar—otherwise they would not be Flood stories in which a few people were saved aboard a ship. But similarity between his tablet and Genesis, as claimed by Finkel, does not equate to precedence for his tablet. His round ark and the Gilgamesh cubic ark would both be hugely unstable in a storm, compared with the original historic biblical Ark with its massive size (137 x 23 x 13.7 metres) and extremely stable dimensions of length to breadth ratio of six to one. Which one would you sooner be aboard during a storm? Built by Dutchman Johan Huibers in 2011, this is his full-size, weatherproof, ocean-going concept of what Noah’s Ark really looked like. Yes, Noah did build an Ark! Did the Jews adopt the story from Babylon? Not so! 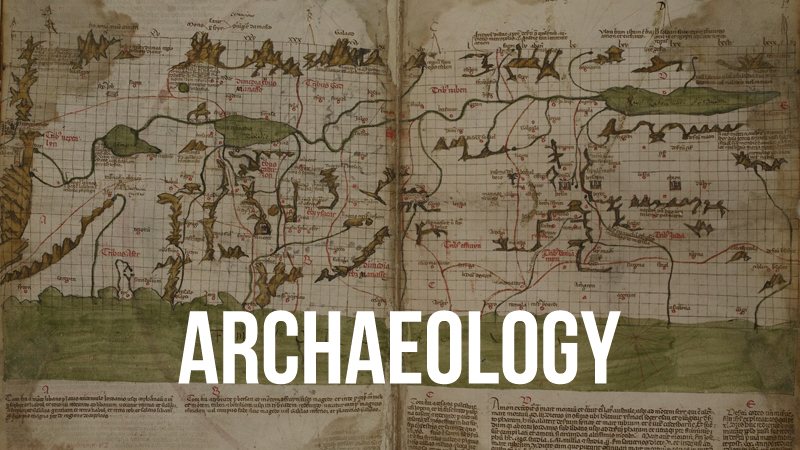 The idea that the Judaean Jews concocted their own history during or after their captivity in Babylon, although also taught by many liberal Bible colleges and seminaries today, is absolutely incorrect. Many times in the rest of the Old Testament, Moses is said to have been the writer—impossible if Moses was a fictional character, ‘invented’ in Babylon, e.g. Joshua 1:7–8; 8:32–34; Judges 3:4; 1 Kings 2:3; 2 Kings 14:6; 21:8; 2 Chronicles 25:4; Ezra 6:18; Nehemiah 8:1; 13:1; Daniel 9:11–13. In the New Testament, the Lord Jesus Christ frequently spoke of Moses’ writings or the Law of Moses, e.g. Matthew 8:4; 19:7–8; Mark 7:10; 12:26; Luke 24:27, 44; John 5:46–47; 7:19. 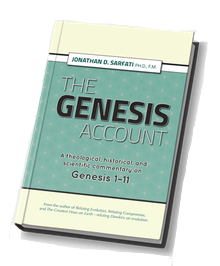 Extract from Sarfati, J., The Genesis Account, Chapter 1. Precursor (it is not a toledot):6 Genesis 1:1–2:3. The creation of the entire universe in six days. There is no toledot, since God is not the result of anything but the cause of all. Man and woman, both of whom God created in His image, are the pinnacle of creation, and blessed. Toledot of the heavens and earth, Genesis 2:4–4:26. ‘What followed from creation’, and in particular what became of the crowning point of creation. That is, their fall from perfection into sin, and the curse on the cosmos. Toledot of Adam, Genesis 5:1–6:8. ‘What followed from Adam’. This section continues the further degeneration of man into utter wickness. We see the two main lines of descendants: Cain’s line and Seth’s line. This toledot starts with blessing in 5:1–2 but ends in God’s intention to blot out mankind in 6:7. Toledot of Noah, Genesis 6:9–9:29. ‘What followed from Noah’. Here we have God’s curse on the wicked earth in the Flood, but the blessing of saving Noah’s family on the Ark. Then the reverse: the righteous Noah becomes drunk, which leads to the curse on Canaan. Toledot of Noah’s three sons, Genesis 10:1–11:9. ‘What followed from Shem, Japheth, and Ham’. Here we have the descendants of the patriarchs founding nations. This account starts with the blessing of the population expansion, and ends with the curse of the confusion of languages at Babel “in the days of Peleg” (10:25). This confusion was the cause of the previously mentioned dispersion into nations. Toledot of Shem, Genesis 11:10–26. ‘The expansion of what became of Shem’. From the previous curse, God singles out one lineage for blessing—the lineage that would lead to Abraham and finally to Christ. Toledot of Terah, Genesis 11:27–25:11. ‘What followed from Terah’, i.e. Abraham. Even the line of Shem largely degenerated into idolatry, including Terah. But God chose Abraham from this line. Mankind would be blessed by him, his descendants, and most importantly by his seed, the Messiah. This long section covers the life of Abraham and the Abrahamic Covenant. Toledot of Ishmael, Genesis 25:12–18. ‘What followed from Ishmael’. This tells us of the descendants of the non-seed line of Abraham, to finish discussion of these and concentrate on the Seed line. Toledot of Isaac, Genesis 25:19–35:29. ‘What followed from Isaac’, the Seed son, and in particular, his Seed son, Jacob. Here we see Jacob fight for the blessing that God had promised him. Jacob is called a perfect or blameless man (Genesis 25:27)—the same word tam (תם) used to describe Noah (Genesis 6:9) and Job (Job 1:1). Jacob has been unfairly treated by Bible translations that call him a ‘plain’ or ‘quiet’ man. Toledot of Esau, Genesis 36:1–8. ‘What followed from Esau’. Again, this dismisses the lines of a non-seed line by an account of his three wives and five sons. Toledot of Esau, Genesis 36:9–37:1. A second one of Esau, but this time as “the father of the Edomites”. Here we see the ancestry of three non-seed nations: the Edomites, Horites, and Amalekites. These were historic enemies of Israel, and ruled the land before the Israelite kings. By contrast, Jacob had to leave the land to begin Israel’s sojourn into Egypt. Toledot of Jacob, Genesis 37:2–50:26. ‘What followed from Jacob’, i.e. the 12 tribes of Israel and especially Joseph. This ends with Jacob’s descendants still out of the land in Egypt. In modern Hebrew, the sheva (the ‘ə’ in tôlədôt) is not pronounced, so the word is sometimes transcribed ‘toldot’. Skinner, J., A Critical and Exegetical Commentary on Genesis, p. 41, International Critical Commentaries, T&T Clark, Edinburgh, 1910. Wolters, A.M., Creation Regained, p. 37, Paternoster Press, Carlisle, UK, 1996. Kulikovsky, A.S., Creation, Fall, Restoration, p. 87, Mentor, Christian Focus Publications, Fearn, Ross-shire, 2009. After Fruchtenbaum, A.G., The Book of Genesis, pp. 6–10, Ariel’s Bible Commentary, Ariel Ministries, San Antonio, TX, 2009. This list is deliberately started at 0. There is a precedent in the four laws of thermodynamics; what is called ‘the Zeroth Law of Thermodynamics’ was formulated after the First, Second and Third Laws, though foundational for them. Believers in the truth of God’s Word need not be disturbed by Finkel’s allegations about a round Ark; nor should their confidence be shaken by his claim that the Ark narrative in Genesis originated during the Jewish exile in Babylon from the 6th century BC. The Mosaic authorship of the Pentateuch (Genesis – Deuteronomy) is well attested in Scripture, and strongly supported by conservative scholars. Christians can believe with confidence all that the Bible says. Skeptics and all others who treat God or His Word as irrelevant would do well to reconsider. 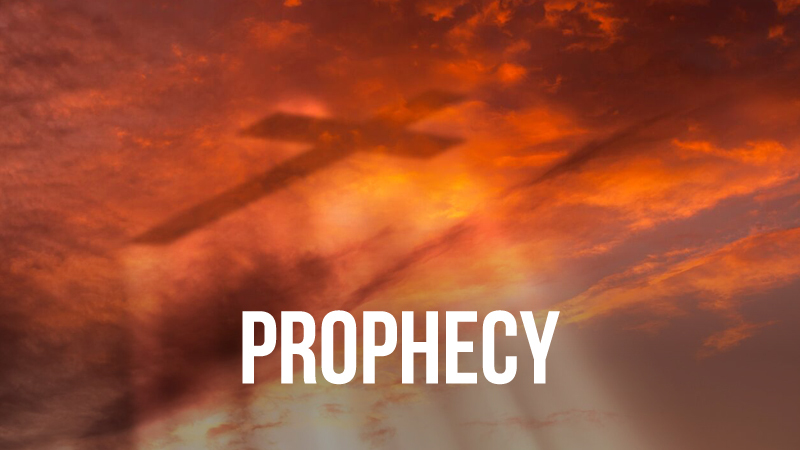 The Bible teaches that a future worldwide cataclysm is coming, and this one will be by fire (2 Peter 3:10–12). As with Noah’s Flood, God has provided a means of escape from the coming calamity, namely faith in the Lord Jesus Christ and His death on the cross as the remedy for sin. Believers can take confidence in God’s Word and rejoice. Non-believers should take warning that they reject God’s Word to their eternal loss.